If we were the Hulk, we'd cart about mega-speakers all day long. But we're not. So we can't. For those lacking superhuman strength, there exists the Muvo mini. 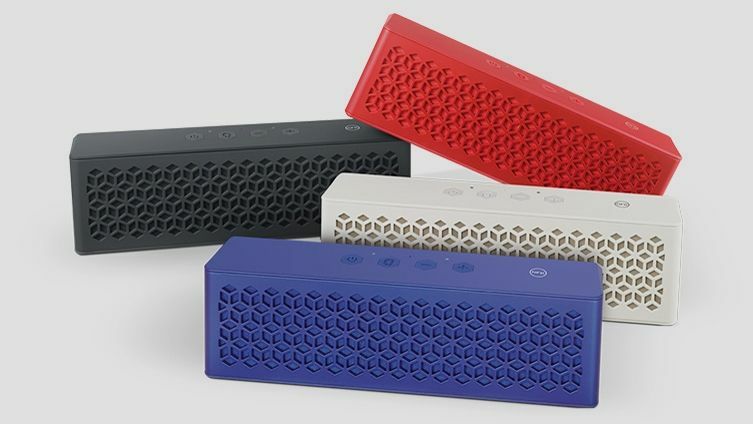 Creative has launched the brand new Muvo mini, a miniature bluetooth speaker that'll fit snug in a bag and satisfy on-the-move audiophiles worldwide. Small speakers often squeak out lackluster beats, but Creative says it's designed the Muvo mini to deliver loud sound and powerful bass despite its teeny form factor. "We want our users to be able to enjoy an optimal audio experience in the most compact-sized speaker that they can put into their pockets or purses, and bring it along wherever they go," says Chew Eng Niu, Senior Manager for Creative's multimedia products. Creative optimised the mini's innards to make certain the audio wouldn't be disappointing, opting for wide-range drivers that can pump out some serious sound. "To ensure that this tiny speaker delivers astoundingly loud and clear stereo sound, two highly-tuned and lightweight full-range drivers were selected for us." It 'll also operate a front-facing radiator that enhances the mini's bass, a hard effect to achieve on small speakers. The Muvo mini is also touted as weatherproof, able to 'withstand the harshest of weather elements', meeting IP66 ingress protection standards. "Whether at a picnic at the beach, a BBQ, partying by the pool, or calling your family, the MUVO mini is a perfect weatherproof companion wherever you go," boasted Niu. The device will come in four colour options - namely red, blue, white, and blue - and sports a spiffing rubber coat for added grip. The Muvo mini charges via USB and connects to your smartphone with built-in Bluetooth NFC tech up to a range of 10 meters.There's also a 3.5mm aux-in port if you're not ready to ditch the cables just yet. Excitingly, the pint-sized speaker system will keep pumping out beats for 10-hours straight thanks to its beefy 2200mAh Li-Ion battery. If you're looking to pick up your very own ultra-portable Muvo mini, they're available in the UK from today for £49.99 over at Creative's online store.